The event was held in order to discuss the continuing significance of German philosopher Karl Marx, known widely for “The Communist Manifesto,” and to examine the impact his work has had on the world with his 200th birthday in 2018. The panelists included moderator and associate professor Dr. Stephen Sullivan of the English and philosophy department; David Obringer, archivist at the Baron-Forness Library; Dr. Jingze Jiang, associate professor in the department of business and economics; Robert Diehl, alumnus of Edinboro University as a triple major in philosophy, sociology and economics; and Dr. Lee Williams, associate professor in the department of sociology. Obringer, being an archivist, detailed Marx’s history and how the manifesto came about. He stated that Marx, born in 1818, received his doctorate in philosophy from the University of Berlin, and even had connections to the world of journalism: he edited the Rhineland newspaper for a period of time. However, the paper was a radical left-wing publication, which led to his exile from Germany in 1843. From there, Marx moved to Paris, where, upon starting another publication, was accordingly exiled from France shortly after. However, it was after this that Marx met Friedrich Engels, the man who co-edited a newspaper with him and would later be the co-author of the manifesto. Divided into four parts, the first section mainly concerns labor issues, which he described as a battle between the elite bourgeoisie and the working-class proletariat. In simple terms, Marx wanted the proletariat to seize the means of production from the rich in a glorious revolution that would bring about a new way of life in which all people are equal contributors to themselves and society. To summarize his arguments, Obringer quoted Marx, who proclaimed at the end of the book, “Working men of all nations, unite!” He pointed out that the most important part of the statement was “all,” citing that many failures in communism were a result of isolated efforts at communist states instead of massive worldwide pushes. A look at an isolated effort was given by Jiang, who shared her perspective after being born and raised in China. After a discussion of different economic theories in addition to Marx’s, she shared information about China’s success and failure with different economic systems over time. Using the visual aid of a timeline, Jiang charted out the success and wealth of countries from 1800 to present day, while explaining the systems at play at different times. For instance, Jiang argued that for a long period of time, China’s government had complete control of the economy, which stifled the growth of wealth. However, when the government gave citizens more freedom to own land and production, their GDP has steadily increased. By bringing this up, Jiang intended to show the truth of some economic theories: sometimes they work, and other times they do not. In order to shed more light on Marx, though, Diehl came prepared to present his portion on Marx’s theories of ideology. 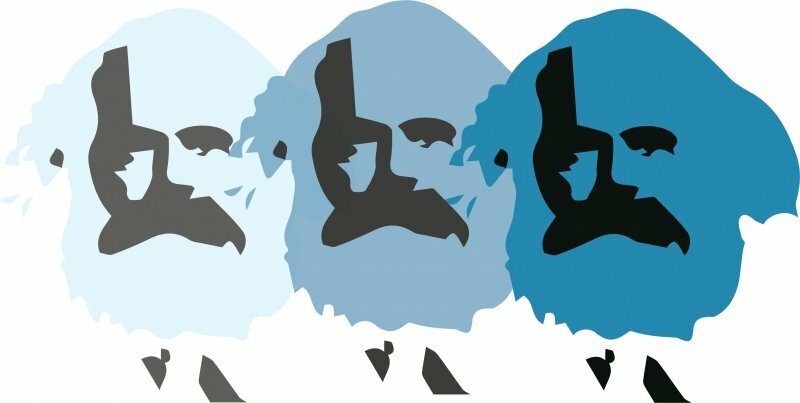 “Along with the economic theories of capital [and] the notion of class struggle, ideology is one of the most important concepts we get out of Marx, both philosophically and in terms of [political practice],” said Diehl. The concept of ideology, according to Diehl, is that ideas drive the development of society as well as the overall state of culture, politics, science and the way we think about ourselves and the world. In addition, Diehl tracked the progression of ideology through the years, from Marx to Althusser, to postmodern ideology to even capitalist realism, the latter of which finds that there is no possible alternative to capitalism; this situation is propagated through a “cultural sterility,” which Diehl exemplified through the current movie industry overwhelmed with reboots and sequels instead of new content and ideas. He promptly answered this question with a resounding “yes,” citing that Marx’s name is likely said all over the world every day, as well as the fact that the manifesto is the most commonly assigned text in philosophy classes. Williams then proceeded to point out flaws he sees in capitalists, finding that they don’t care about people; he reasoned that this was because if they did care, the world wouldn’t be facing many of the problems it does today. As a result, Williams thinks that many of us are alienated and unable to be happy anymore. Instead, Williams thinks that society needs to generally get back to a place where people are “making stuff,” because when people create, “We’ve self-actualized; we’ve reached a state of nirvana.” However, he explained that just making alone will not suffice; you have to make things that you are happy making for either yourself or the personal enjoyment of those around you. Overall, Williams finds that doing this will contribute to a better, more organized future. On his 200th birthday, Marx does seem to live on through scholarly discussions both in Edinboro and around the world.